This topic contains 1 reply, has 2 voices, and was last updated by Mark Stücklin 4 years, 1 month ago. I read your article in the latest edition of ‘A Place in the Sun’ magazine with great interest and wondered if you might shed some light on my situation! I have a property on an urbanisation just outside Torrevieja on the southern Costa Blanca where house prices have been in the doldrums for a few years. In 2012 I put it on the market, but unfortunately the most it could achieve were offers in the region of €95K. I originally paid €150K for it in early 2004. I realise I’m not going to get that kind of price for it, but after reading your article it seems that property prices have now stabilised and perhaps increased a little? I really want to sell the property and am wondering whether I should delay selling it for a year or so to allow its value to increase. I have talked to a couple of local agents who think that it could achieve around about €110K or so if I sell now. What do you think, Mark – would I be better waiting a year or so before I put it on the market? I hope you are able to guide me on this – a 3 bed semi-detached property. I can’t comment on your specific case because there are always very local factors in play. I don’t know the market in your area well enough. However, I can say that in house prices in some parts of Spain have bottomed out, and are now starting to rise (my point in the article you read). This is the case in prime Barcelona, Madrid, Marbella, and Ibiza, for example. Despite some localised increases, prices are still very attractive in these areas. I wouldn’t be surprised if prices have stopped falling in the best parts of Torrevieja, but overall it looks like they are still dropping, though less than before. To help illustrate the point I’ve prepared a graph comparing the change in asking prices in Barcelona and Torre Vieja with 2Q 2007 as the base (100). 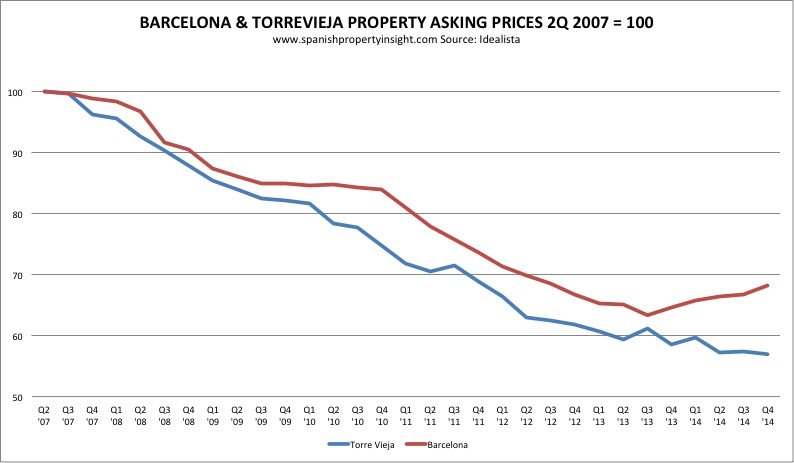 As you can see, asking prices have been rising in Barcelona since 3Q 2013, but are still declining in the Torrevieja municipality, albeit at a slower rate than before. It also depends on how keen you are to sell. In my personal experience of bearish markets it’s always better to price to sell and get out quickly.